They say a picture is worth a thousand words, but Augmented Reality gives the United States Holocaust Memorial Museum the opportunity to add some more poignant real words to its exhibits. 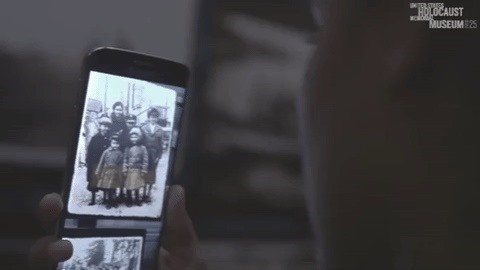 The museum is testing a mobile app that will allow visitors to see more information about the victims and survivors of the Holocaust in the camera view of their smartphone. The technology allows the museum to tell a deeper story about the tragedy, helping to build a more emotional connection between visitors and history. "How do you show the idea of ​​6 million people being murdered as individuals, not as numbers?" said Michael Haley Goldman, director of future projects for the museum, during a video produced by the museum about the experience. "In this case, we use phones so the computer knows where you are and gives you additional information." For example, an exhibition in the museum shows photos of the inhabitants of Eisiskes in Lithuania. According to the video, in 1941, most of the city's 3,000 Jewish residents were massacred within 48 hours. The app tells the visitors the fate of the people in the photos. "The pictures were just from everyday life and how their lives were just normal and then turned around and turned upside down," said Alexa, a 14-year-old student from Spokane, Washington, who had the opportunity to use the app Try out a museum. "Augmented reality has definitely helped, because a picture says a lot of things, but the words that fit the picture have made the experience ten times better than just looking at pictures." "Today you just have to look around the world to understand the timeless relevance of this story," said Lester Crown, family patriarch in a blog post. "Humans are still vulnerable to hate propaganda, be it through speech, the written word or social media, and through the use of digital reach, the museum creates global awareness." The recent advances in AR platforms such as ARKit, ARCore, and Facebook Camera, and in particular image recognition, are providing museum curators and their technology teams with useful tools to realize similar experiences today. With the advent of augmented reality headsets, the museum will be even more exciting AR experiences in the near future.